If you are looking for a new service provider it may be because of an unexpected breakdown or you’re looking for a second opinion or it’s the convenience of our centrally located shop. Whatever the reason, we recognize this is an important decision. 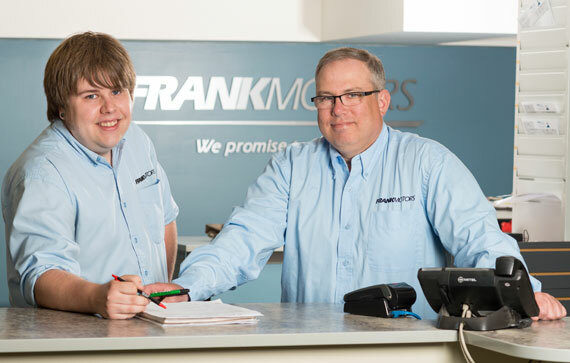 At Frank Motors we promise to know you better, and our New Client Process is the first step of getting to know you and your vehicle's service needs; and for you to get to know us. 1. New Client Intake: The purpose of the New Client Intake is to get to know you, the reason for your call and relevant information about your vehicle. 2. First Appointment: We start with a Minor Inspection to see the overall condition of your vehicle because a vehicle's condition can change greatly in a short period of time especially with the road conditions in Winnipeg. 3. Minor Inspection Report: During the Minor Inspection we can identify urgent repairs and report back to you on the issues that brought your vehicle in for service. 4. Recommendations: We will advise you of any recommended repairs that may need to be completed in the future so you can make a confident and educated decision about the services your vehicle needs. 5. Next Service Appointment: Based on the Minor Inspection Report & Recommendations, you’ll receive an estimate for the work required so you can budget for them and we’ll book your appointment in advance to keep your vehicle in safe driving condition. Do you have a new car with a great warranty from the manufacturer? That doesn’t mean you have to get all of your regular service done at the dealership. Want to avoid costly unexpected breakdowns?